You reap what you sow. 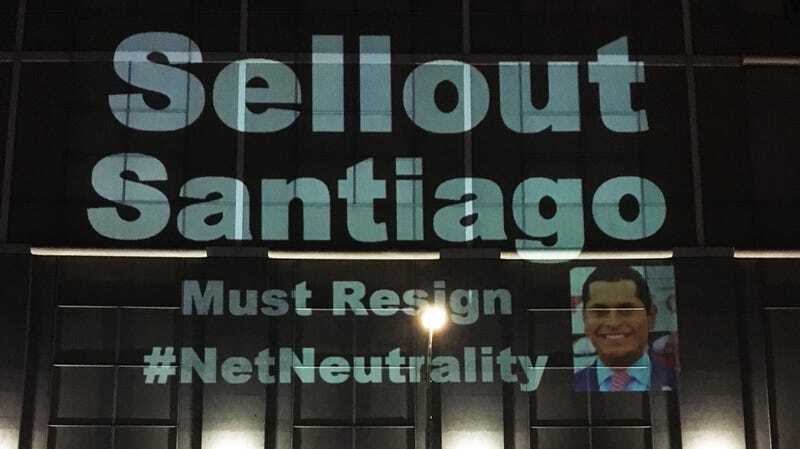 That’s the message activists are bringing after Miguel Santiago, a Democrat of Los Angeles, eviscerated a net neutrality bill before his committee in the California Assembly earlier this week. The reaction to Santiago’s “betrayal,” as many voters are calling it, has been fast and, yes, furious, with accusations of “corruption” being echoed by multiple digital-rights groups that supported the passage of S.B. 822—a comprehensive net neutrality bill proposed by State Sen. Scott Wiener. As the committee’s chair, Santiago refused to allow any debate or testimony over his amendments prior to calling for a vote. The outcome left S.B. 822 stripped of several net neutrality protections. It now contains several loopholes that, if passed, will enable ISPs to congest or block web traffic and potentially charge other businesses unreasonable fees to reach users. The fallout was swift: On Twitter, users have accused the lawmaker of turning his back on the Democratic Party, which is intended to be a unified bulwark against ISP efforts to weaken net neutrality. A spokesperson for California Rep. Nancy Pelosi told Gizmodo that the House Minority Leader was “disappointed” in the outcome of Wednesday’s hearing. The day after the S.B. 822 vote, LA Mayor Eric Garcetti tweeted his thanks to Sen. Wiener, who had attempted to withdraw his bill from the Assembly, saying Santiago’s modifications meant it was no it was no longer a real net neutrality bill. Santiago’s Wikipedia page was also altered temporarily to list “AT&T” as his “spouse” under his personal details. Activists project messages about Assemblyman Miguel Santiago and net neutrality on the AT&T building in Oakland, June 20, 2018. Photo: Alan Marling (Used with permission). Santiago characterized as “sensational” and “anger inducing” claims that he “gutted” the bill and said that both he and his wife had been harassed. “My personal family pictures have been stolen from my social media platforms and used to create memes. Really? Using pictures of my kids? This is a new low,” he said.